Starting July 2, 2018, placing orders on FangJewelry.com official site can waive our 5% transaction fee to Etsy. Many thanks for your support. Click to join our Club, receive EXCLUSIVE discounts! 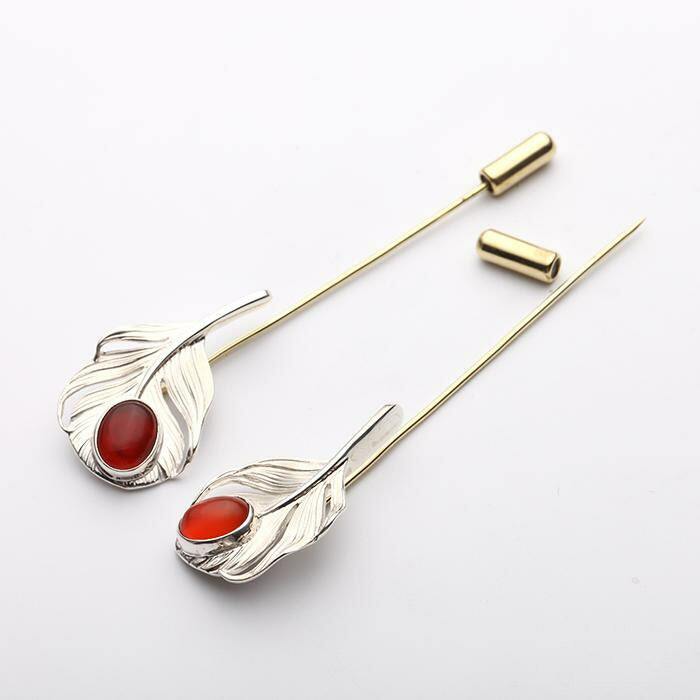 Unique feather lapel pins - modeled on the feathers of the legendary phoenix. The phoenix, also called the ‘Fire Bird’, is the symbol of new life - it rejuvenates itself from ashes and rises up to the sky again. 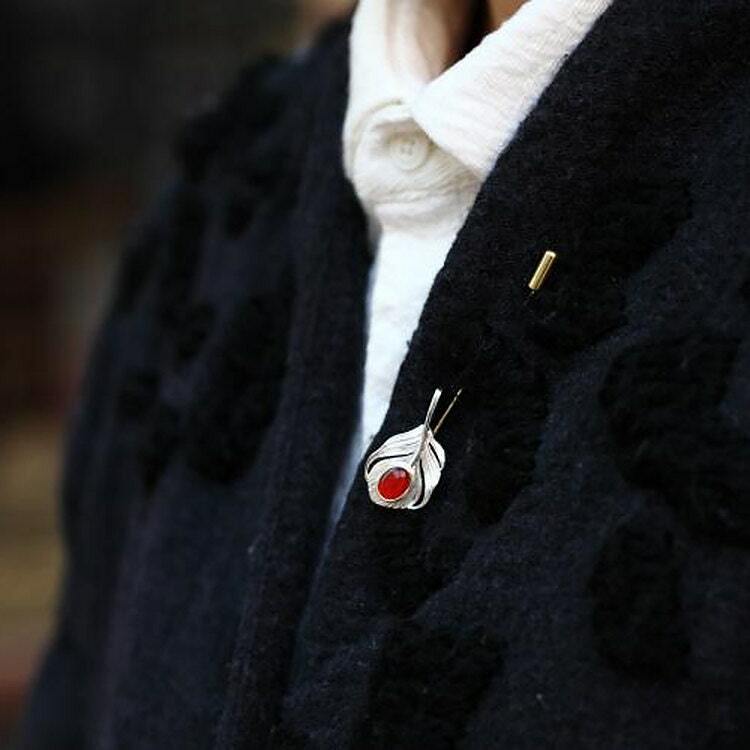 Proudly wear the same spirit on your lapel - with the elegant feather collar pin. 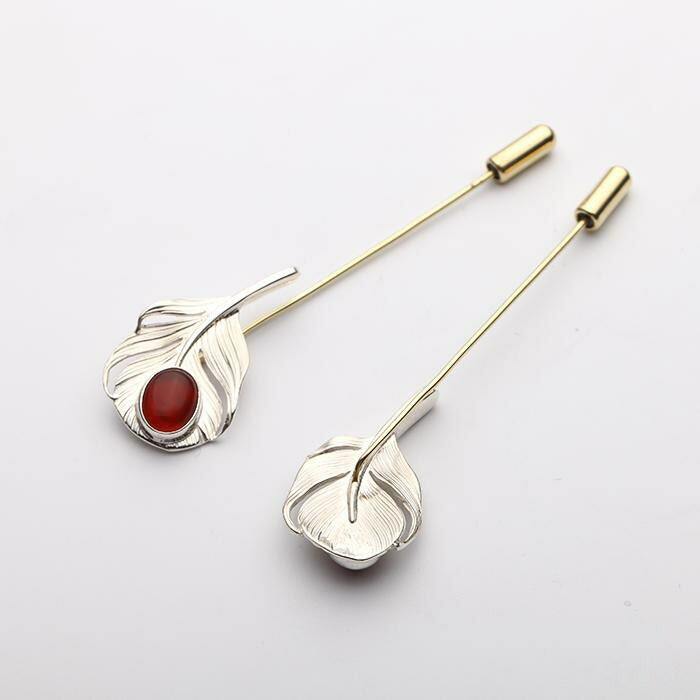 Wear it as a feather boutonniere to a wedding, or wear it as a brooch to your office. Suitable to wear for both men and women. 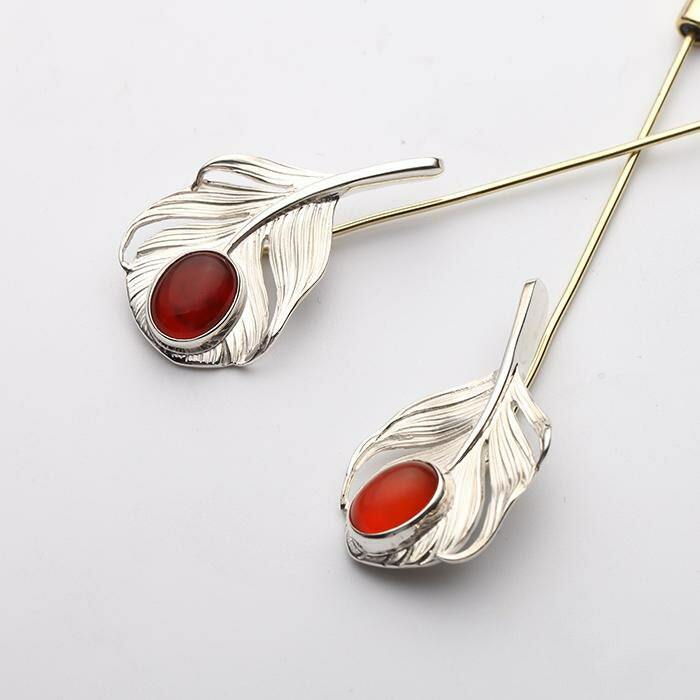 A single oval onyx adds a dash of fiery red color to the silver feather. Please note that we engrave our logo and info on materials we use, even on custom engraved orders. NO REFUNDS or EXCHANGES on custom orders. We will deliver the item in a Natural Kraft Jewelry Box, with drawstring pouch and a jewelry polish cloth. We handcraft each and every piece of jewelry - one at a time in our studio in NYC. Since everything is GUARANTEED handmade, it is all unique and original. It may take upto 2-3 weeks to process your order - please understand that a human will make the piece using their hands, and they also need time to rest, sleep and eat! All our creations are handcrafted to perfection and no details are missed. All gold, silver and brass is tested and every single item is stamped. To fulfill your order, you must provide me with certain information (which you authorized to provide to me), such as your name, email address, postal address, payment information, and the details of the product that you’re ordering. You may also choose to provide me with additional personal information (for a custom order of jewelry, for example), if you contact me directly. For purposes of EU data protection law, I, Liang, am the data controller of your personal information. If you have any questions or concerns, you may contact me at Liang.Fang@fangjewelry.com. All payment is due in full at the time of order, including special orders. We accept Credit Card, Paypal or Etsy's Direct Checkout. Please make sure you put any special requests we have discussed in the "notes to seller" section when you check out. We are obliged by law to collect sales tax of 8.875 percent on all orders from New York State residents. Tax is not included in the price. International - Customer is solely responsible for customs or any other fees! If you need to cancel your order, please contact us within 1 hour of purchase, you are entitled to a full refund. If you notify us later, you may be charged from 25 to 75 percent of the item price, depending on the situation. International: Ships by USPS First Class Mail International / USPS Priority Mail Internation with full insurance according to USPS value rule. Approximately 8-14 business days(first class) / 5-10 business days(priority). If you would like a refund or exchange, please contact us within 7 days of delivery. We must receive the item in the original packaging and the item must be in the condition it was shipped in. If the item has been worn or used we will charge a restocking fee of 20%. Please contact us before you return so we can give you instructions about where to ship. Shipping costs are not refundable and return shipping for exchanges or repairs will be at the cost of the customer. Any repairs or resizing, etc done by a jeweler other than us voids this guarantee. Jewelry is made by our own two hands, so each piece may have a slight variation from what is pictured. We create high-quality handmade jewelry, not mass manufactured pieces. Please specify if you like your custom engraving on inside or outside of your piece, otherwise we will use our design discretion for the location of the custom engraving. We will engrave our small logos and signs of material we use on each of our jewelry, regardless item is custom engraved or not. We offer ring size 3 to 15 with half sizes available. If you don't see your ring size listed, please Convo us. We might be able to provide an item in that size, depends on designs. Please note Resizing can be very time consuming. Return shipping costs and a resizing fee will be charged to the buyer. Make sure you got your right size. 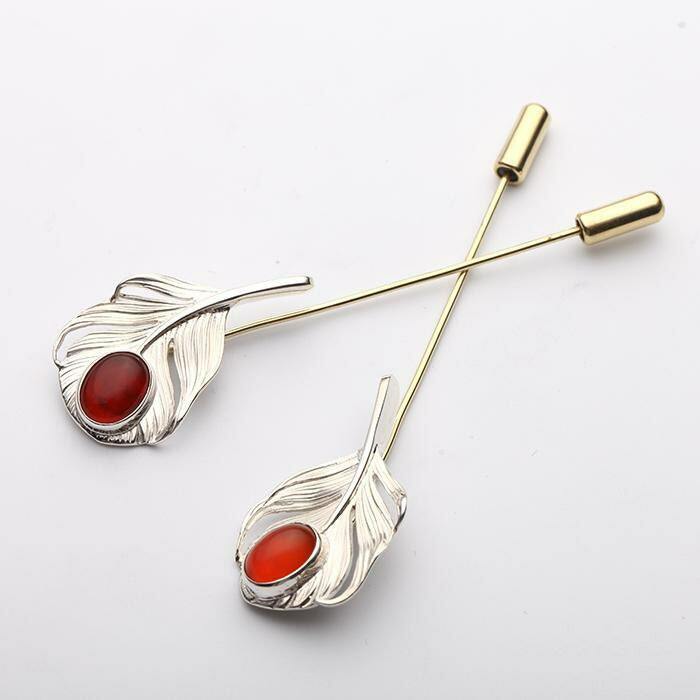 We work with Sterling Silver, Gold, Brass, Gemstones, etc. Metals and gemstones can be changed so that you can have the jewelry of your dreams. Due to the liability involved we do not use customer supplied stones in our jewelry. By default, the silver piece we deliver to you is in original silver color, those are designed to oxidize and wear with time. Some pieces can be oxidized UPON REQUEST, for those we use an oxidization process to darken a piece. On the brass, bronze you may notice some black marks as the oxidization wears off but this shouldn't last forever. Over time, silver, brass and gold, will tarnish with exposure to air, chemicals, and oils in the skin. Pieces are best cleaned by using a jewelry polish cloth. All orders are ready for gifting. It will come with Natural Kraft Jewelry Boxes and Premium Jewelry Polish Cloth. Etsy will let you add a different address when you check out. Instead of an invoice we will include a personalized message from you to the recipient, enter whatever you'd like me to write in the 'notes to seller' when you check out. If you have any questions and requests, please let us know. Should I purchase Original Silver or Oxidation Finish? TO THOSE WHO WANT TO PURCHASE OXIDATION ITEMS: The effect of oxidizing pieces is for a more tarnished and antique look. Depending on the look that the item is designed to be achieved, we may purposely treat the pieces with sulfide to create the look of oxidized jewelry. Upon request we can oxidize the silver piece for you at free of charge, but keep in mind that the oxidation finish can have a slight difference each time and may not be exactly the same as the pictures shown. By default, the silver piece we deliver to you is kept in original silver color, which are designed to wear with time. We strongly RECOMMEND you to choose the original piece as you can enjoy the process of natural oxidation.